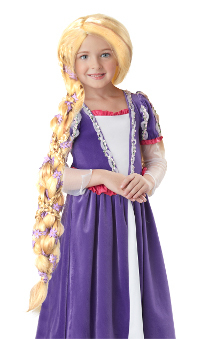 This Rapunzel Wig is blonde with braiding decorated with purple flowers, just like Rapunzel dancing in the town square. Wig only, Rapunzel dress sold separately. The wig may not glow when you sing like in the Tangled movie, but your Rapuzel costume will be complete with this child size Rapunzel Wig.